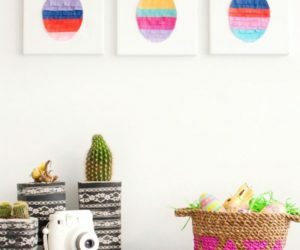 Once more, Easter is just around the corner and that means it’s time to start planning all sorts of fun activities and let’s not forget about the Easter decor. This year you should plan something special. We have 50 great ideas for you to check out and to choose from. 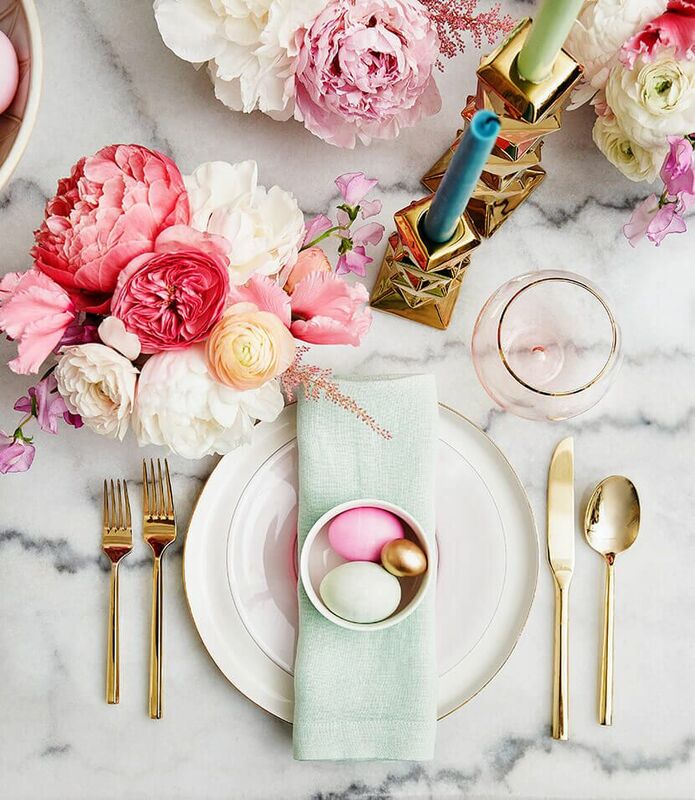 We’re focusing on Easter table decorations and with so many different ideas to pick from we just know you’ll find something that suits your style. Let’s get started! We absolutely love terrariums. 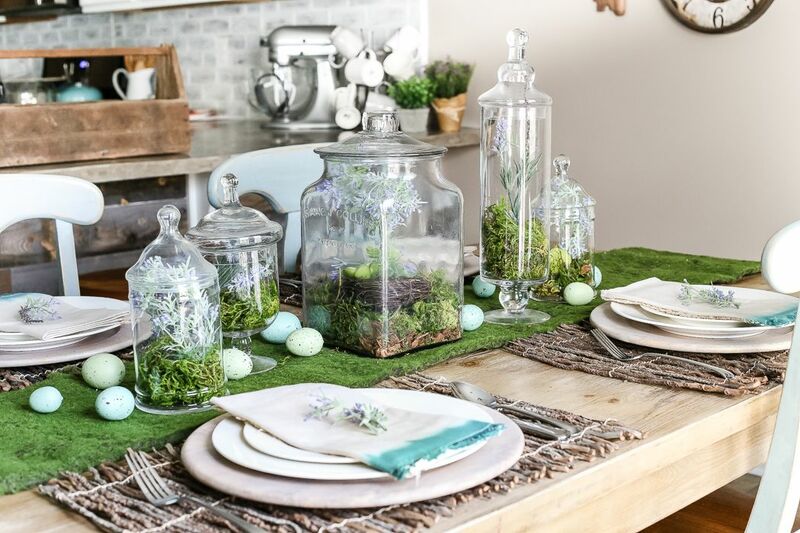 We love their freshness and the fact that there’s an infinity of ways in which they can be customized so how about an Easter table decor with a moss runner and apothecary jar terrariums as centerpieces? A few colorful Easter eggs would look lovely on the runner as well. You don’t have to make the terrariums too complicated…just put some moss, some pebbles, a few seasonal clippings and other such things inside. On you can see how such an arrangement would look like. As we said before, you don’t have to go out of your way to make the Easter table decorations stand out. There are plenty of simple ideas which can stand out just fine. For example, you might be able to find all you need for your Easter decor at the grocery store and this way you’ll save and effort. Have a look at these beautiful flowers and these cute chocolate bunnies that we found on . Aren’t they adorable? Want to create a cozy ambiance? 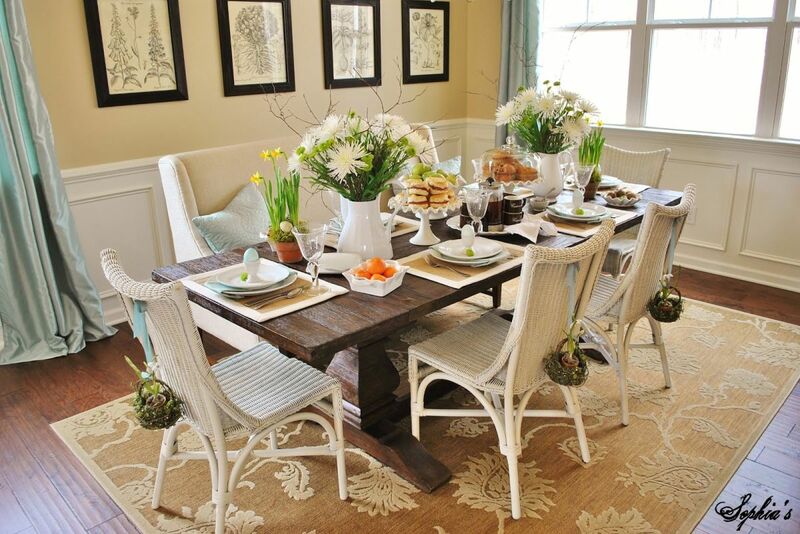 Perhaps you’d enjoy creating a rustic table decor this Easter. You can find plenty of inspiration for that on . 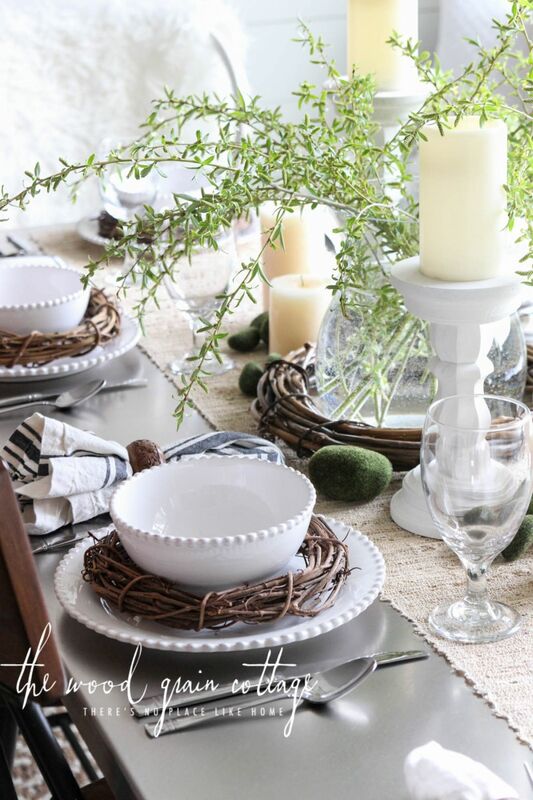 The elements used here include lace-trimmed napkins, twig placemats, driftwood chargers, wood pillar candleholders, a jute table runner, wood slices, bottles turned into vases and some other things like decorative little nests with leaves and colored eggs. If you’re the type that likes to craft things and to make cool stuff out of paper, we have some wonderful Easter decorating ideas that you’ll love, like these crepe paper tulips. Those bulbs are actually a sweet surprise: they’re filled with tiny chocolate eggs. The tulips are made of crepe paper (you’ll need pink, green and white paper if you want the tulips to look just like these ones). You can find all the details about this fun project on . 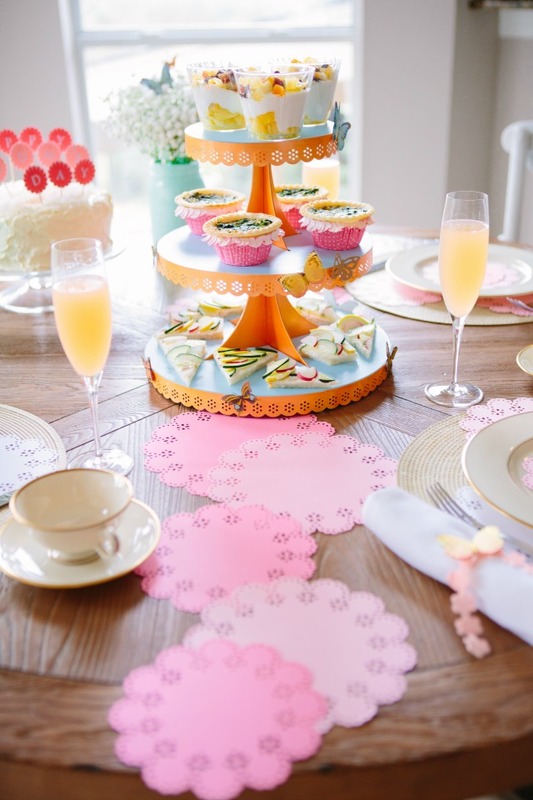 This Easter bunny tiered tray featured on is by far one of the most adorable things we’ve ever seen. Of course, the chances for you to find s tray just like this one are very slim but you can always improvise and create your own version. 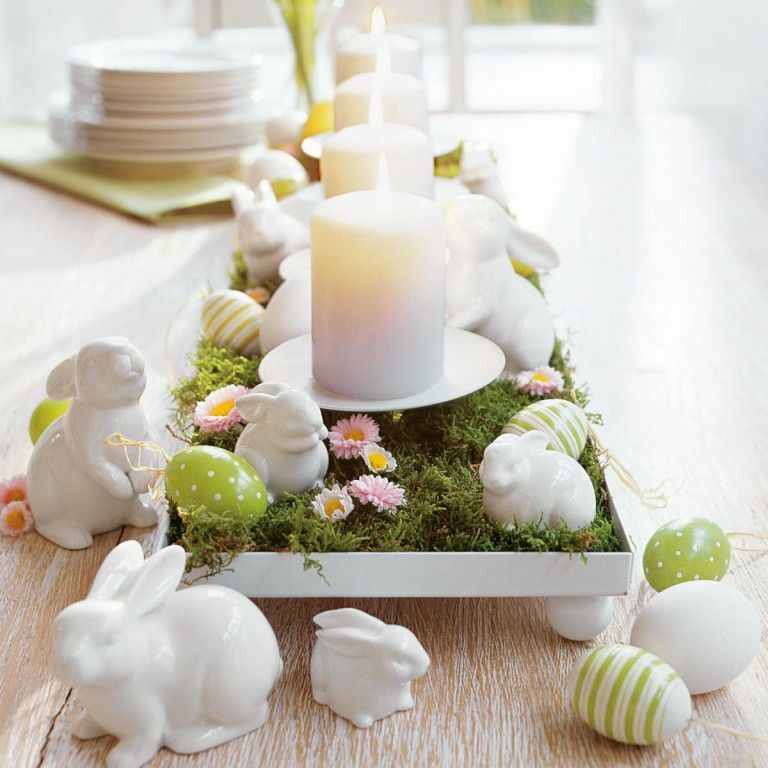 As far as the rest of the table decorations are concerned, there are also those bunnies with baskets full of candy that we really love that cute Easter-themed wreath decorated with carrots, eggs and spring flowers. 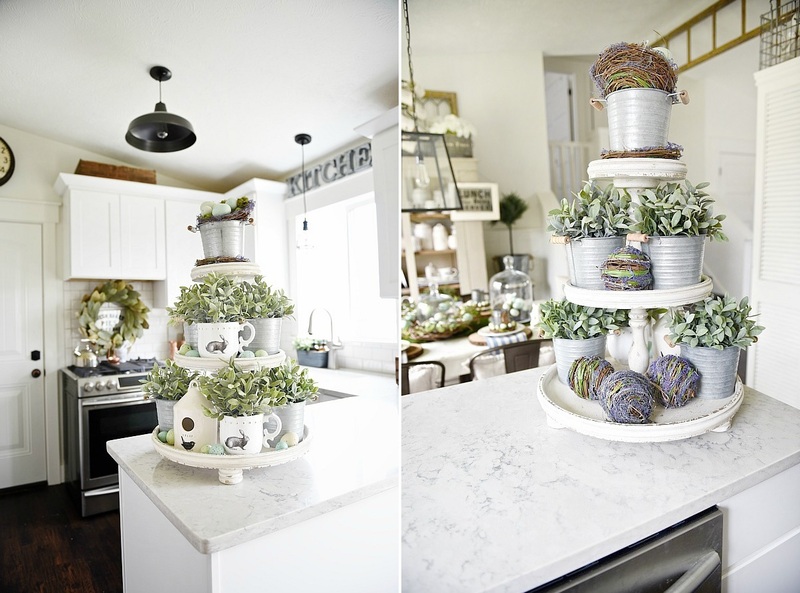 Since we mentioned tiered trays, let’s check out another one, this time found on . 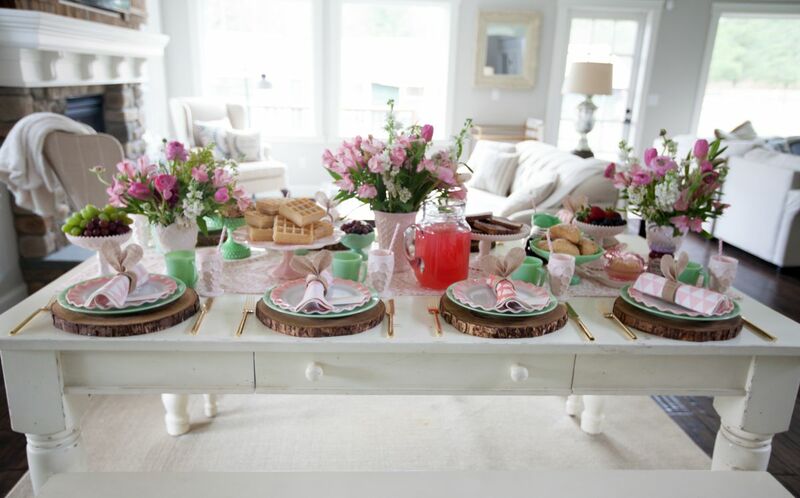 It’s a three-tiered tray that just screams spring. It’s decorated with things like faux eggs, tiny nests, adorable bunny mugs, a cute little birdhouse, planters and faux greens and it could make a perfect centerpiece for the Easter table. If you can’t replicate the look exactly, be creative and work with what you have. 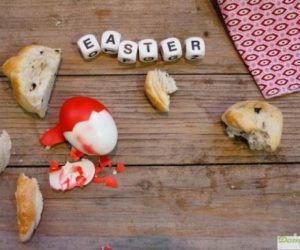 It’s often the little things that matter the most and that also applies to all the Easter decorating ideas that we’ve prepared for you today. Let’s have a look at this beautiful table decor featured on . The ensemble as a whole is cohesive and very beautiful indeed but it wouldn’t be the same without those adorable bunny napkins or the wood slice chargers. If you’re not a big fan of large and colorful flowers that’s fine because there are plenty of other Easter decorating ideas which don’t actually include them. 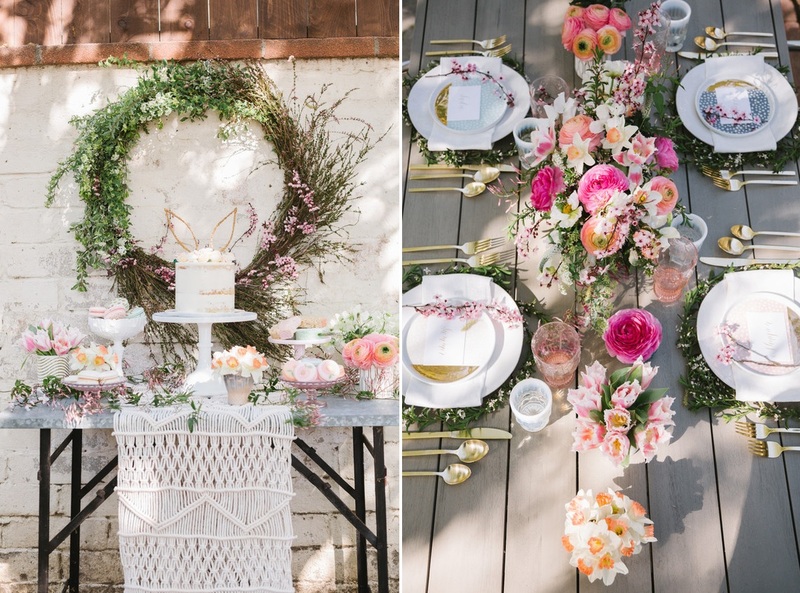 For example, the tablescape featured on still has blooms but not the big and eye-catching kind. 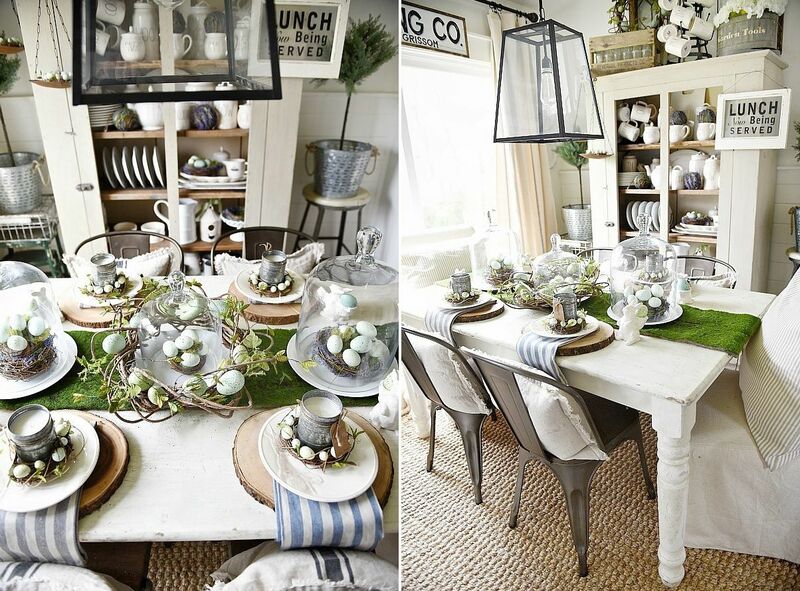 This farmhouse-chic decor uses tree blossoms combined with lots of faux eggs and bird’s nests. The colors are soft and muted and that sets a relaxing ambiance. If the weather is nice, perhaps you’d like to celebrate Easter outdoors. 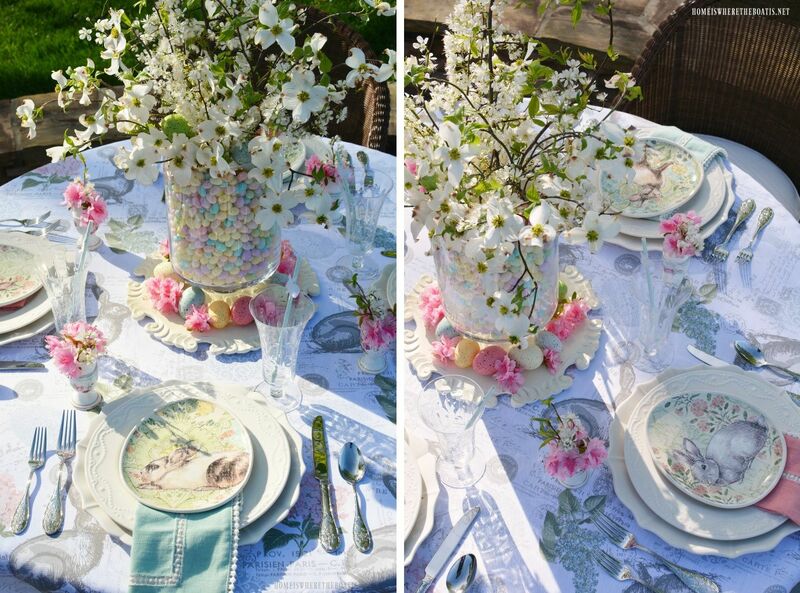 Put a table out in the yard, preferably under a tree, decorate it with a lace runner and some themed little elements such as these adorable bunny macarons featured on . Also, gather bouquets of flowers of different types and colors and display them on the table in simple vases or in glass jars. With so much freshness and so many different cute flowers all around in spring it’s hard to choose a type but why should you anyway when you can mix up all your favorites and create a vibrant Easter decor? There are many ways in which you can display fresh flowers. One idea is to use some little ones to make napkin rings. Check out for more details on that. Naturally, you don’t have to add too many colors to your Easter table decor if you don’t want to. 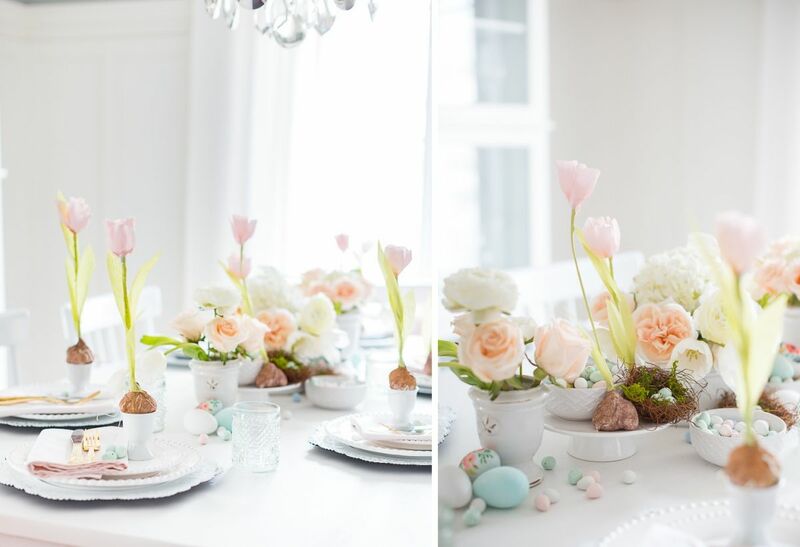 In that sense, you should check out where you’ll find this gorgeous easter table decorated only in shades of white and green on a neutral background. 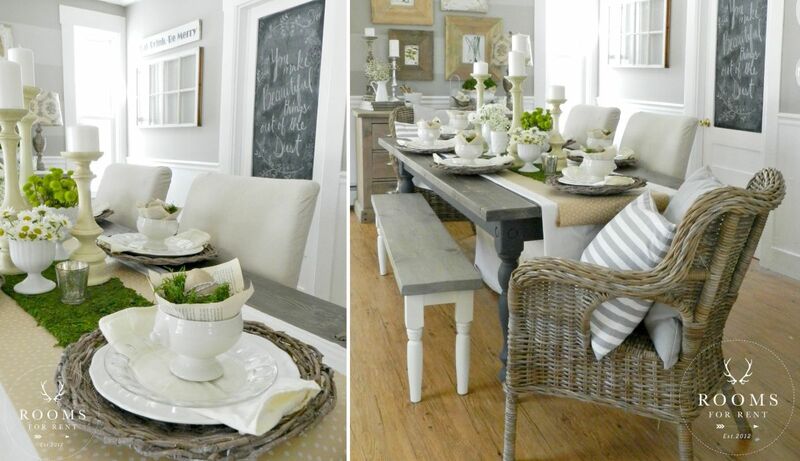 We love the overall simplicity and the shabby-chic details that create a sense of comfort all around them. Whether you’re planning an indoor Easter celebration or an outdoor day of fun, this blooming centerpiece featured on would look charming no matter what. 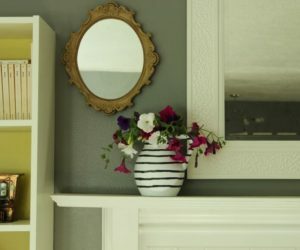 If you’d like to make one just like it, you’ll need a large glass vase and a smaller one that fits inside with room to spare. In between them you’ll have to put jelly beans that look like tiny sprinkled eggs. After that, fill the small vase with plum tree branches (cherry blossoms would look awesome too). 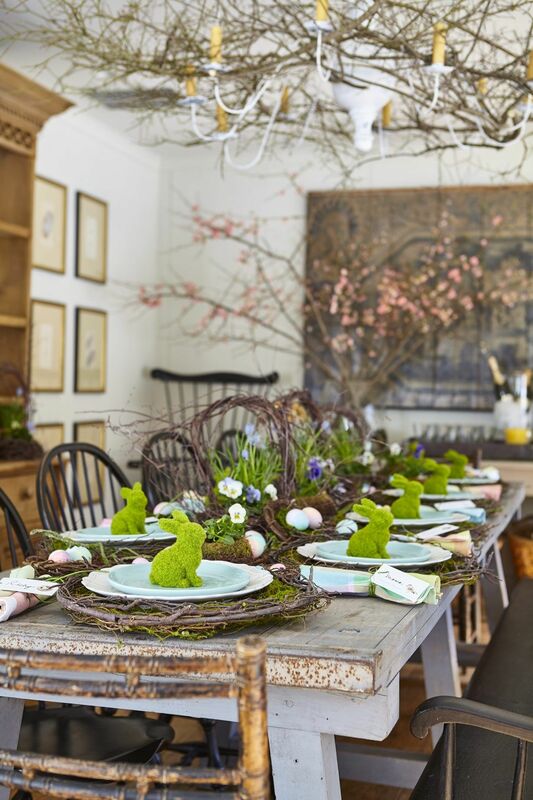 Another cool idea is to create a woodland-inspired table decor with cute moss bunnies, grapevine wreath and moss chargers, twig nests and fresh grass and spring flowers. 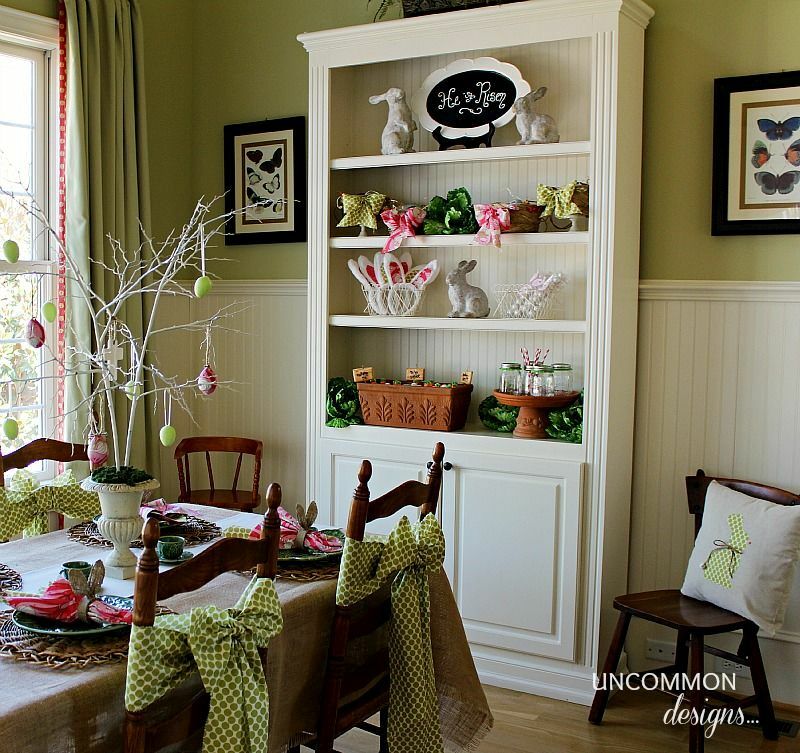 The inspiration for this fabulous Easter decor idea comes from . Don’t forget to sprinkle some faux eggs between the centerpieces as well. 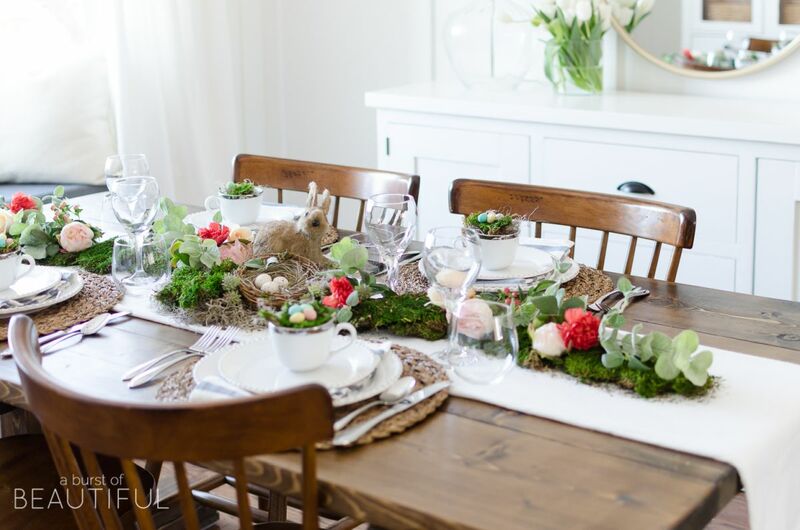 Moss is actually one of the coolest things you can use when planning this year’s Easter table decorations. 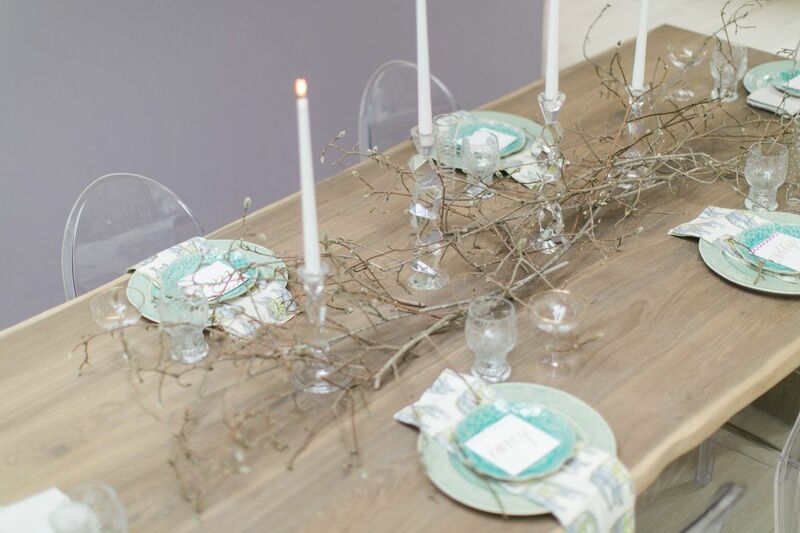 Even something as simple as a moss table runner can cheer up the ensemble. 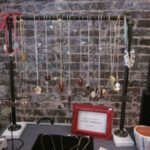 You can complement it with things like wood slice chargers, nests filled with faux eggs and even wreaths decorated with greenery and eggs. Have a look at this post from for more inspiration. 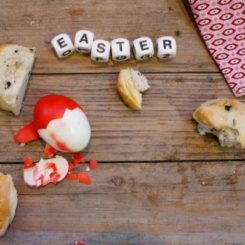 Still haven’t found that perfect Easter decorating idea for your table? 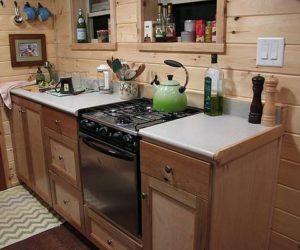 How about a fresh vignette like the one we found on . You can start out with a big round basket. 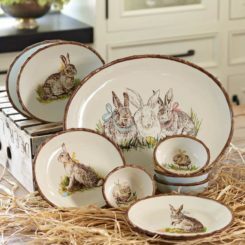 Put a towel in the bottom of it and then start adding accessories, a bunny-shaped dish if you have one, a pitcher filled with stock and faux tulips, faux Easter eggs in bowls and another pitcher filled with green flatware. 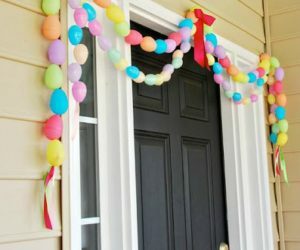 There are also a bunch of fun Easter decorating ideas for kids that you can try this year. You can check out for some inspiration with that. 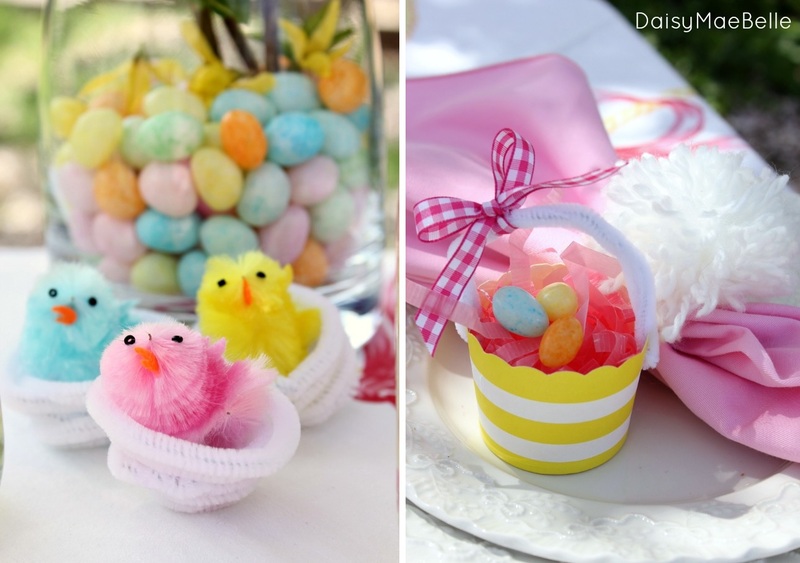 You could fill baskets with colorful candy-filled eggs, decorate with cute little chicks in little nests, fill vases with candy eggs and use paper flowers instead of the real kind. The kids could have fun crafting some of these things and you could help them. Turning empty egg shells into tiny planters is really easy and the results are adorable. Just look at this table centerpiece from for instance. It’s not just cute but also very inspiring. 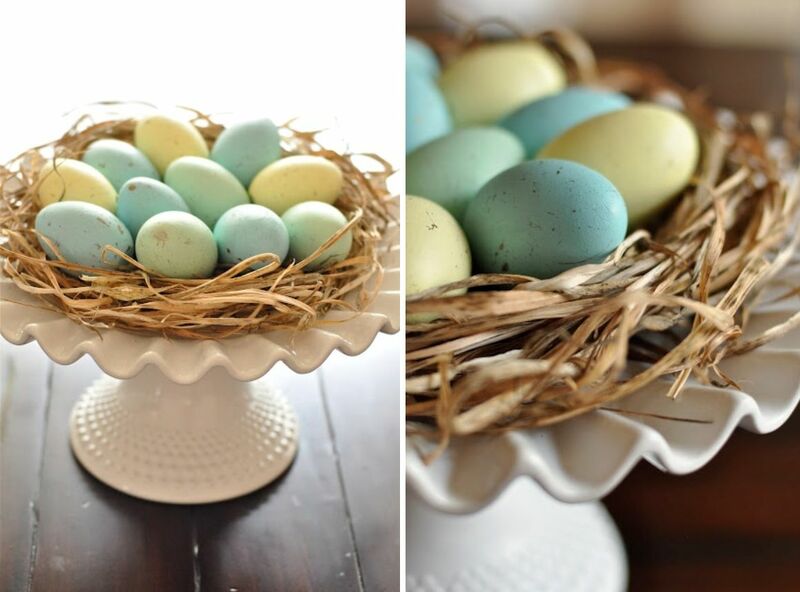 You could display something like this on your table this Easter and you could paint the egg shells for a themed look. You’ll also need a log but if you can’t find out a wooden block could work too. 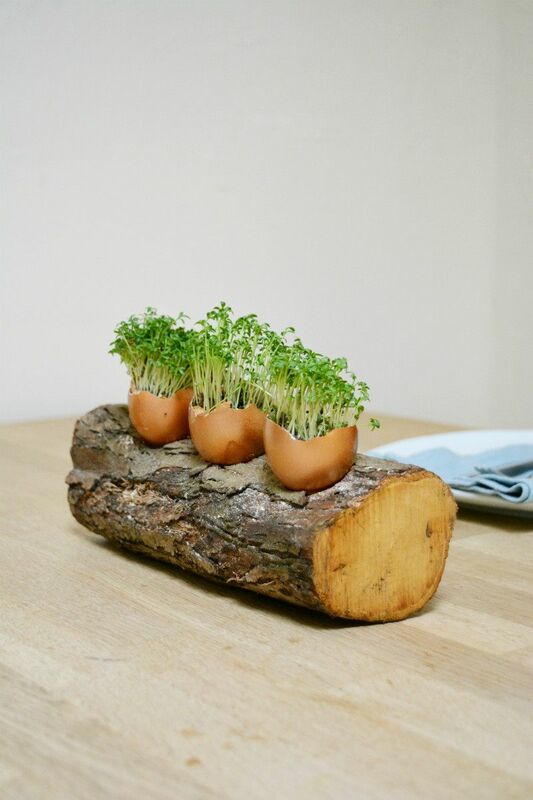 You could also improvise and use something else like an actual egg carton filled with moss. 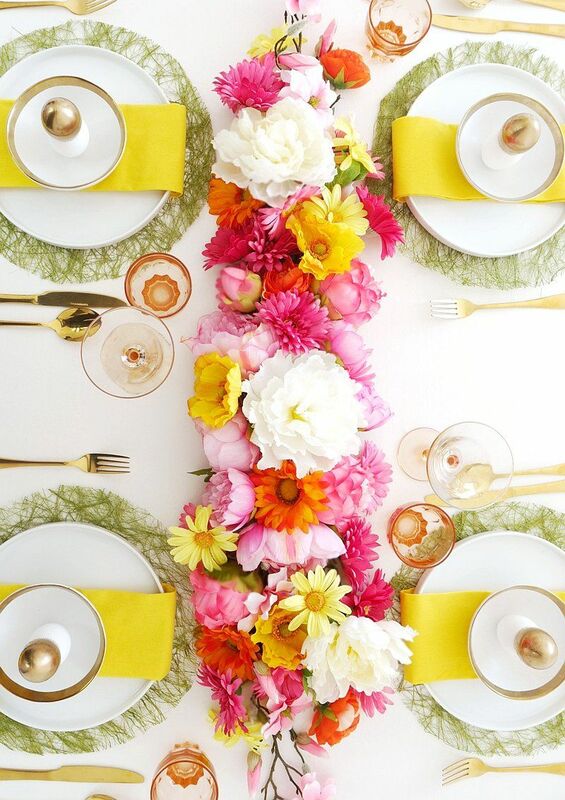 If you like flowers and you’d like to make them a part of your Easter table decor, check out this floral runner featured on . 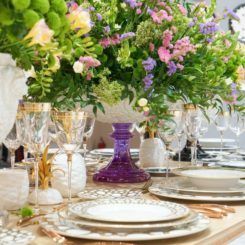 It’s bursting with color and energy and it definitely has the potential to become a focal point not just for the table but for the whole room. The materials used for this project include a lot of silk flowers in various colors and sizes, floral tape and floral wire. How cute are these napkin bunnies? We think they’re adorable and we love the fact that they’re so easy to make you only need a minute to do it. Take a napkin, fold it into a triangle, roll it and then wrap it around an egg. The ends will look like bunny ears. You can tie the napkin with ribbon. Don’t forget to paint the egg to give it a cute bunny face. Have a look at the tutorial from for more tips. 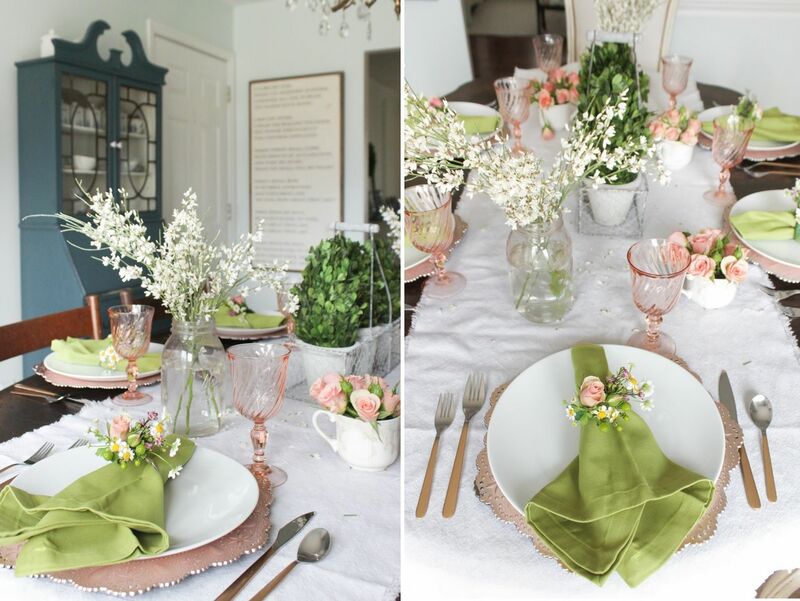 Can’t decide on a single set of colors for your Easter table? 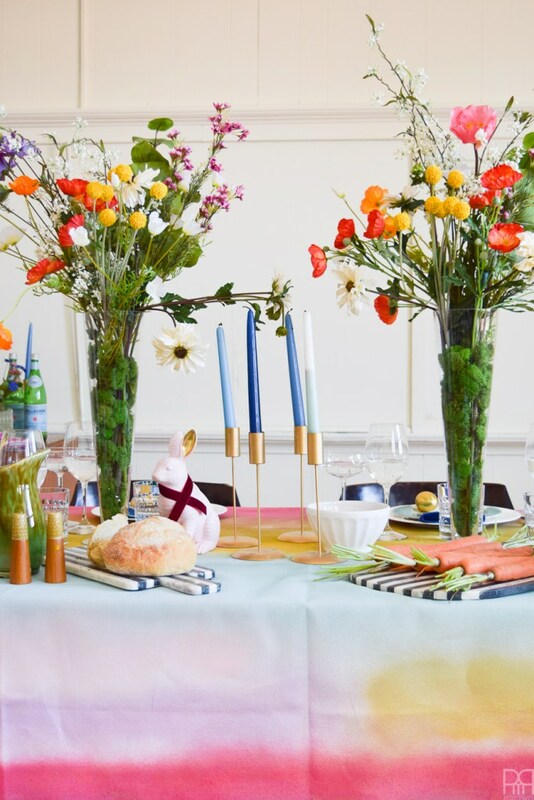 Create a tablescape with a rainbow of colors on it. A fun idea (one we encountered on ) can be to take a plain tablecloth and to spray paint it creating layers…stripes of different colors that bleed into one another. The decorations and centerpieces can be a source of funky colors on their own. 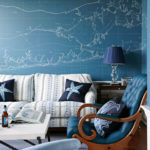 Spring decorating is fun and energizing and Easter is the perfect opportunity to put some of the ideas into practice. You could celebrate with a bunch of fresh centerpieces and by that we mean lovely plants and flowers put in cute and colorful pots, buckets or vases. 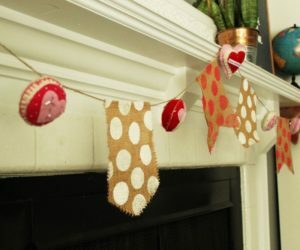 Add to that some cute and festive ornaments such as cloth bunnies or salt and pepper shakers shaped like chicks or Easter eggs. Check out for more inspiration in this sense. Once again we’ll say that it’s not about the amount of ornaments you put on the table or their size but about the way you display them. 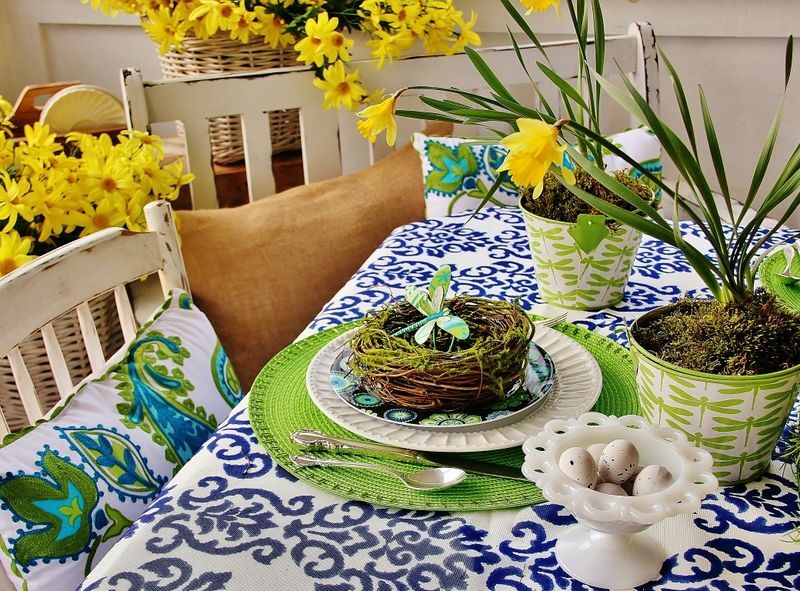 For instance, suggests a rather simple Easter decorating idea for the table, with white pitchers full of flowers, seasonal flowers in small pots topped with moss and cute little moss baskets hanging on the back of each chair. Still searching for a theme for your Easter table decorations? How about bunnies? They’re cute and fluffy and everyone loves them. 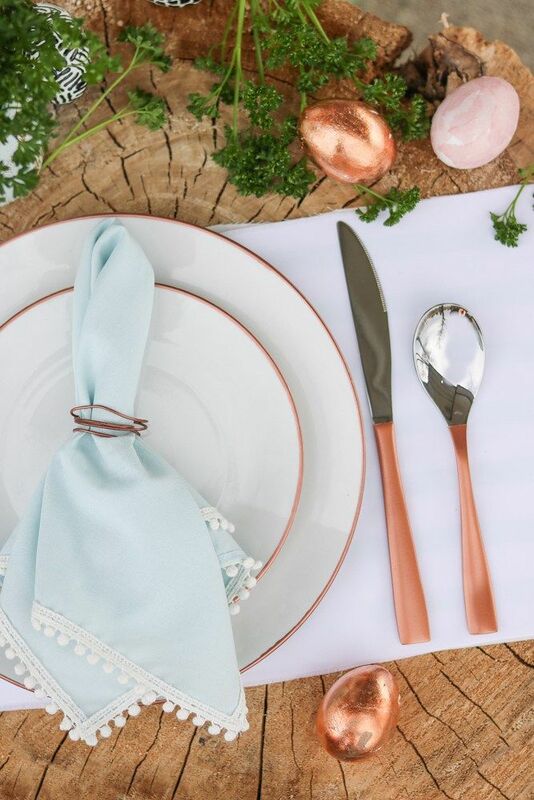 You could make burlap napkin rings with bunny ears, bunny-shaped s, baby carrot ornaments and even some wearables for your guests. Speaking of which, some bunny-themed picture props would be fun too. The bunny idea comes from . For a touch of vintage elegance, we suggest Easter decorating ideas focused on certain materials, finishes or colors that represent this style. 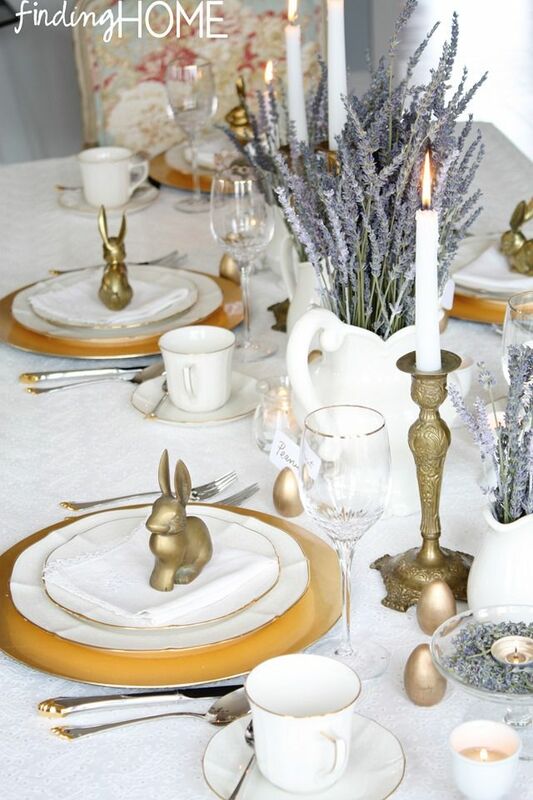 For instance, an Easter decor based on lavender and vintage brass would look wonderful. Check out to see a materialization of this very idea. Every little accessory helps when creating a table setting, whether it’s for Easter, Christmas or any other occasion. That being said, let’s see how you can make your napkins special. 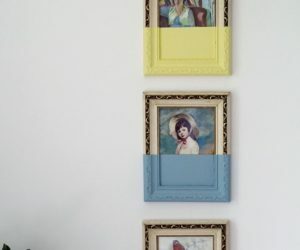 One option is to customize them with a cute pom-pom trim. 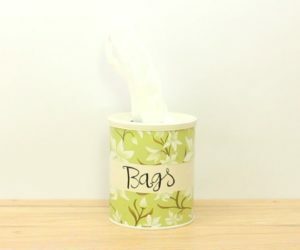 The idea comes from and here you’ll also find the list of supplies needed for this craft. 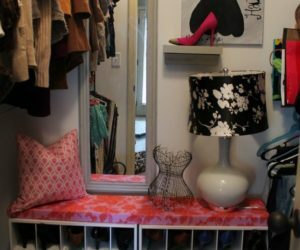 The list includes fabric, pom-pom trim (in a color that matches the fabric or, even better, white), scissors, thread and a sewing machine. 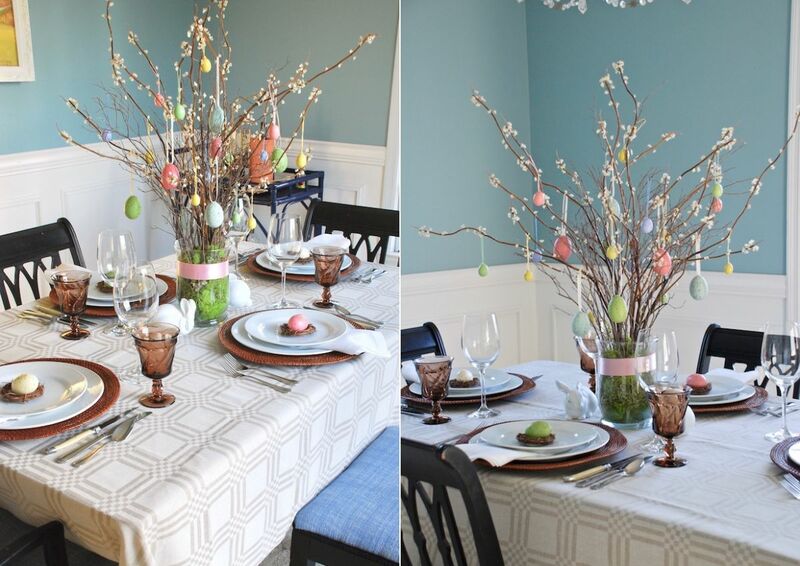 We already showed you one method for making an Easter vignette for the table and now we’ll show you another. 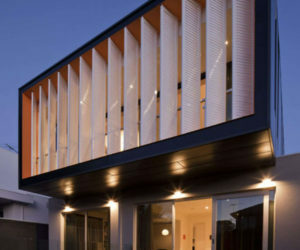 This design idea also comes from . 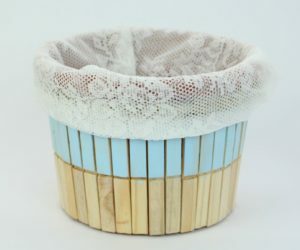 The design starts with a round basket. A tray could work too if you can’t find a suitable basket. Since it’s Easter, a bunny ornament is a must-have in this case. The idea here was to create a vignette using various shades of orange, hence the orange straws, the orange flatware and those orange pansies planted in a cup. Even the eggs that sit on straws match the theme. The tulips create a nice contrast with their pink accents. 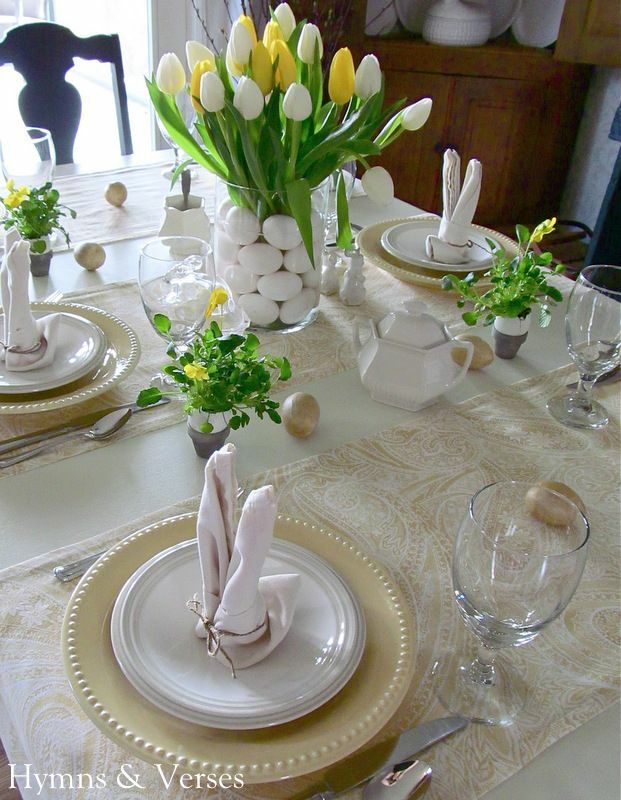 Another idea is to decorate the Easter table with pastel tones and gold accents. The inspiration source for this is . We love the balance of colors featured here and the way in which the gold candle holders and flatware complement the whole ensemble, giving the tablescape a glamorous look. 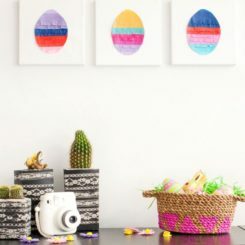 Speaking of beautiful colors and color combinations, you absolutely must check out these stylish Easter decor ideas from . We love how crisp the contrasts and how fresh every single colors looks. The lilac, the pink and the green look stunning against the crisp white backdrop and textures used are really charming too. Let’s now move on to something rustic with a hint of modern. 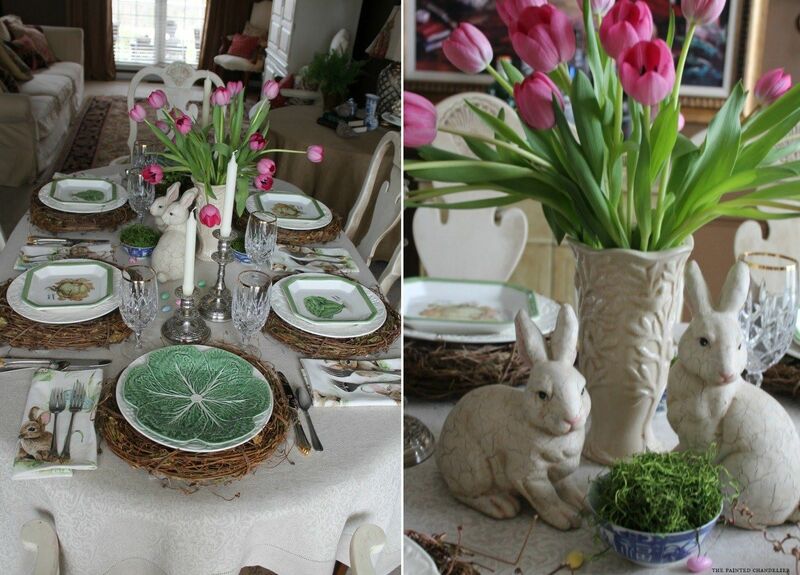 We’re talking about the Easter table arrangement featured on . 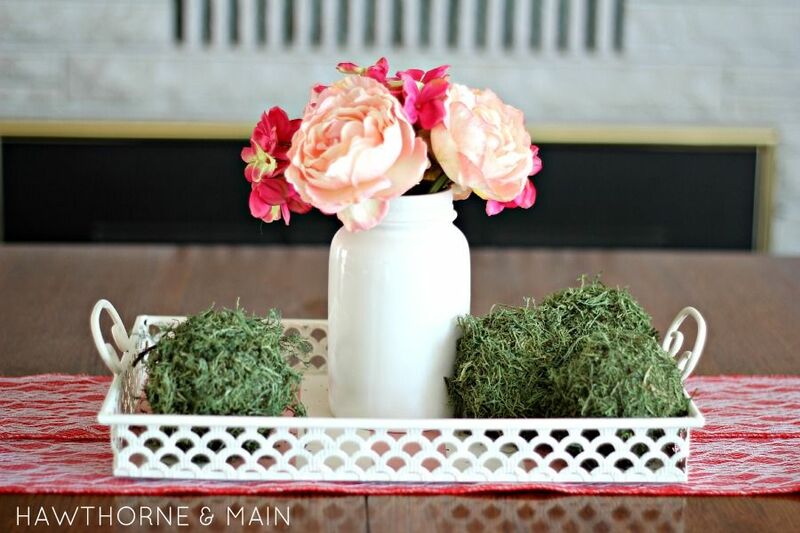 Moss, fresh flowers, straws and twigs were used together to create a lovely centerpiece. The fluffy bunny ornament and the nest with eggs mark this joyful occasion. The Easter tree featured on is another fun and interesting option to consider. 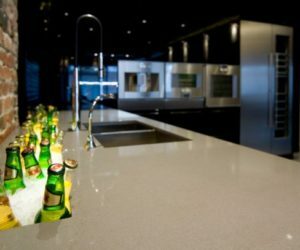 You could decorate it with faux eggs which can either be painted or decorated with colored markers. Here you can also notice an interesting mixture of complementary elements. 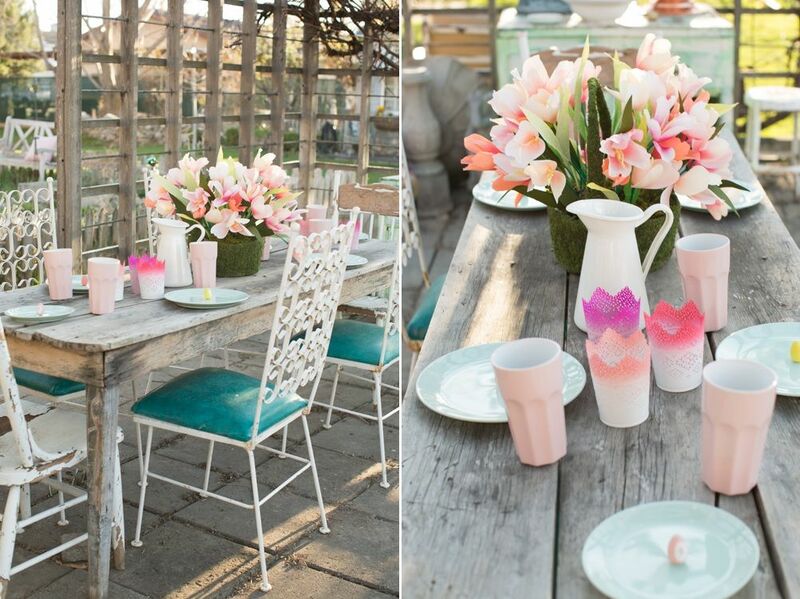 More specifically, we’re talking about the pastels which look beautiful in combination with the brown, rustic accents. We also found some inspiration in a post from . Here we encountered for the first time an Easter table decoration that sort of looked like an ant nest and also a cute dragonfly with wings made of paper. Daffodils are also an important part of this tablescape’s design and it makes a lot of sense since these are spring flowers. Tulips are also spring flowers and they come in a variety of beautiful colors. 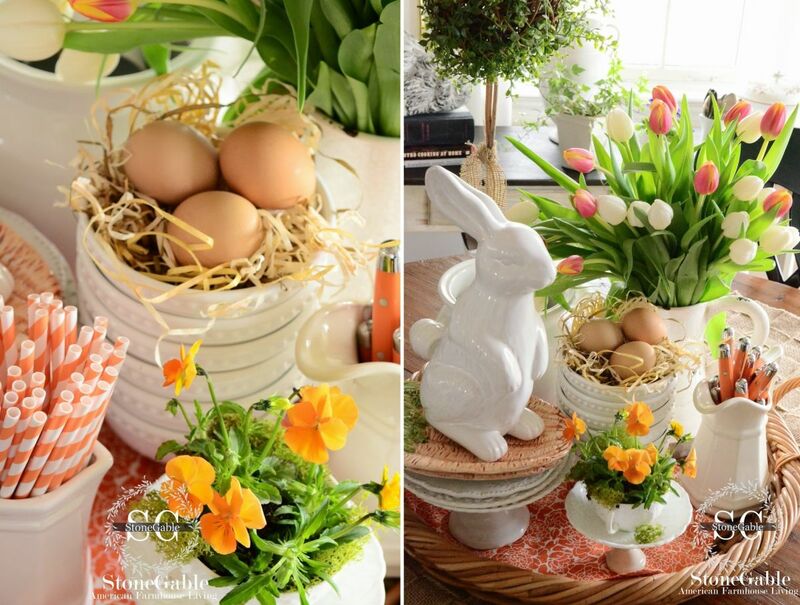 You can mix and match these to create stylish centerpieces for the Easter table. You can put the tulips in mason jars for a touch of rustic simplicity. If you don’t like the way plain jars look like, you could paint them. The ones used on have a lovely blue tint which is pretty easy to obtain. Sometimes the individual details matter less than the big picture and what’s important is the way in which they interact and complement each other. 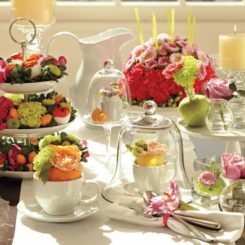 Once such case can be observed on where you can find a charming Easter tablescape that stands out through its overall beauty, not the interesting nature of its inidividual decorations. 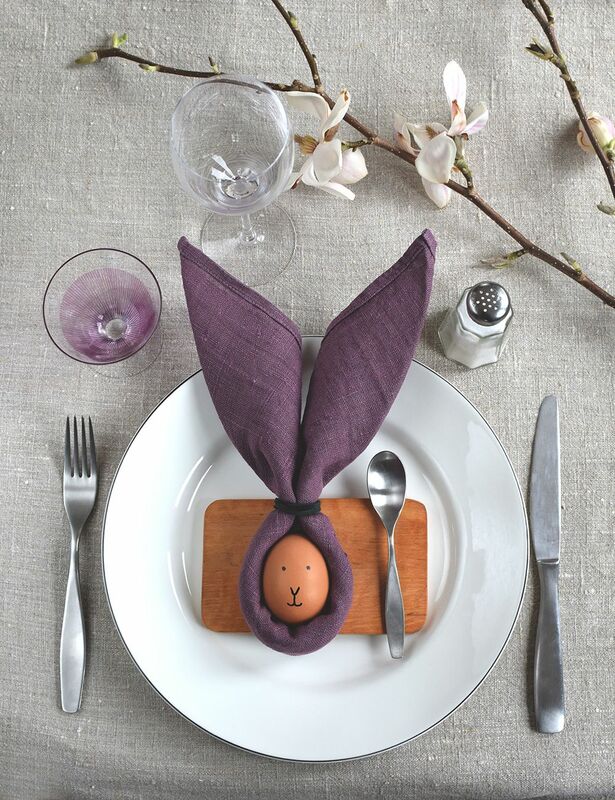 On we came across this rather interesting easter table setting. Even though at its base the design is simple, there’s something very charming about each individual element and about the setting as a whole. 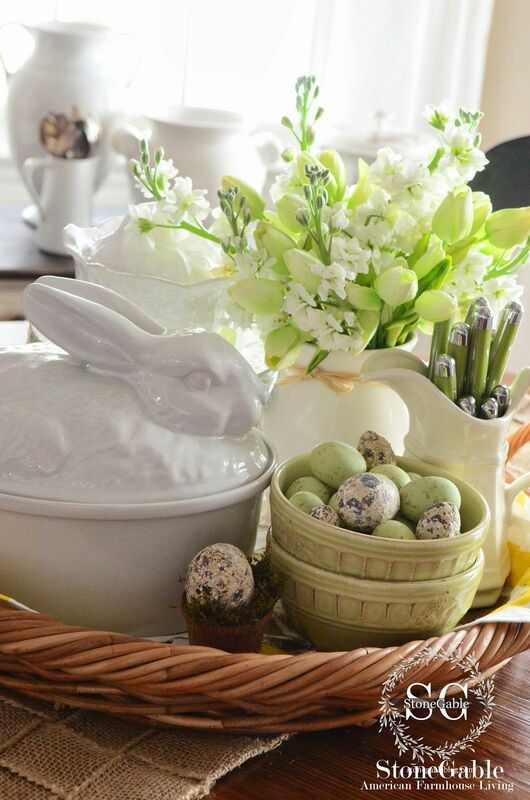 Check out the glass vase filled with yellow tulips and white eggs, the bunny-shaped napkins and those adorable eggshell planters. They’re all displayed on an elegant tablecloth. 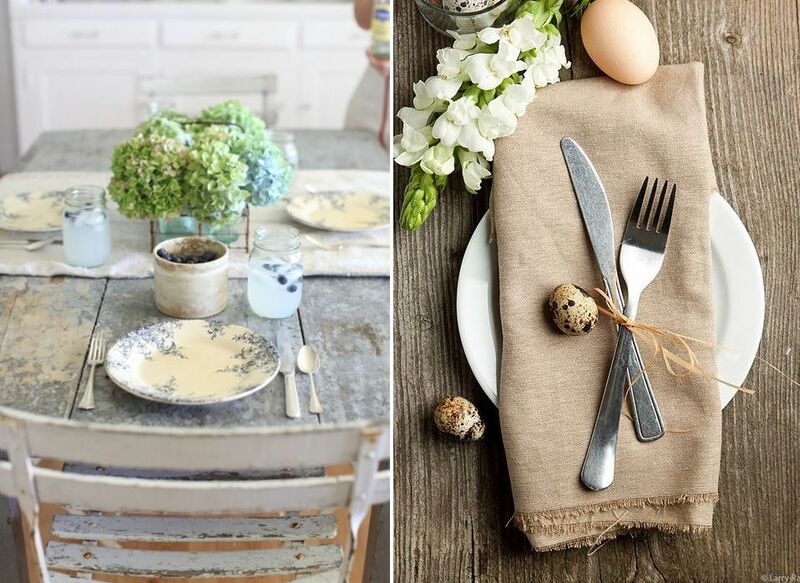 If you’re thinking of going for a rustic Easter decor this year, there are plenty of ideas which might interest you, including this one that we found on . This centerpiece features a woven basket inside which there’s a lamb sculpture, some moss-covered eggs, a lovely twig nest and these seasonal flowers which smell amazing. In case you’re not that crazy about the lamp, you could replace it with a cute bunny. 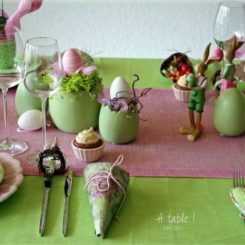 An idea can be to invest in some Easter table decorations which you can reuse next year and the year after that and so on. Of course, that works if you’re not the type of person that gets bored easily or that likes to reinvent things constantly. In any case, you might like to find yourself some themed chargers, plates or vases which can last for years and years. Perhaps the table decor featured on can inspire you. The centerpieces featured on are simple but that doesn’t stop them from being very charming or from looking amazing. We love the daffodils which have been planted in bowls that match those that hold the Easter eggs. We also like the fact that the eggs come in two simple colors, one of which is the natural brown color of the shell and the other a pastel blue. 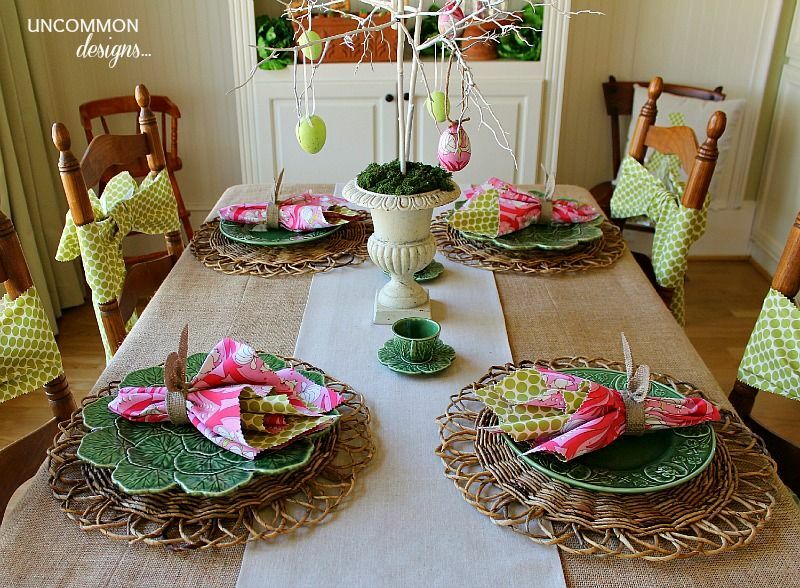 Another simple Easter table decor idea comes from . 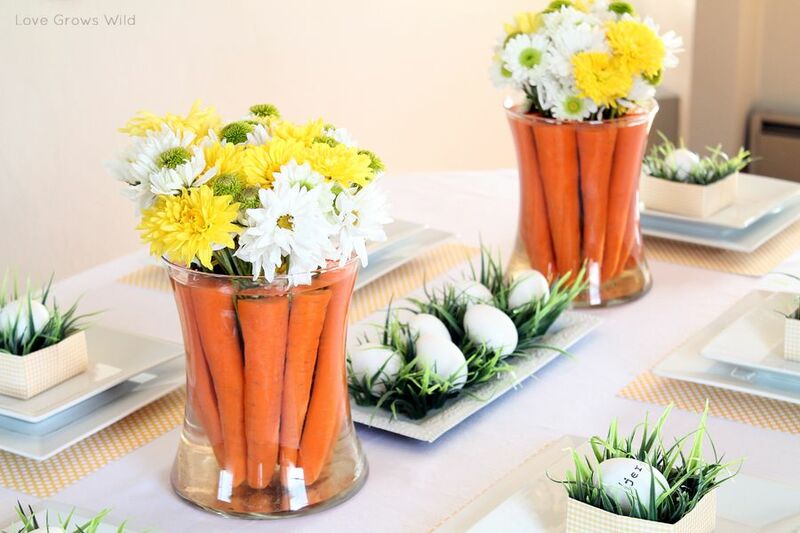 Here we found centerpieces that combine carrots and fresh flowers in clear glass containers and white hardboiled eggs nestled on faux grass. 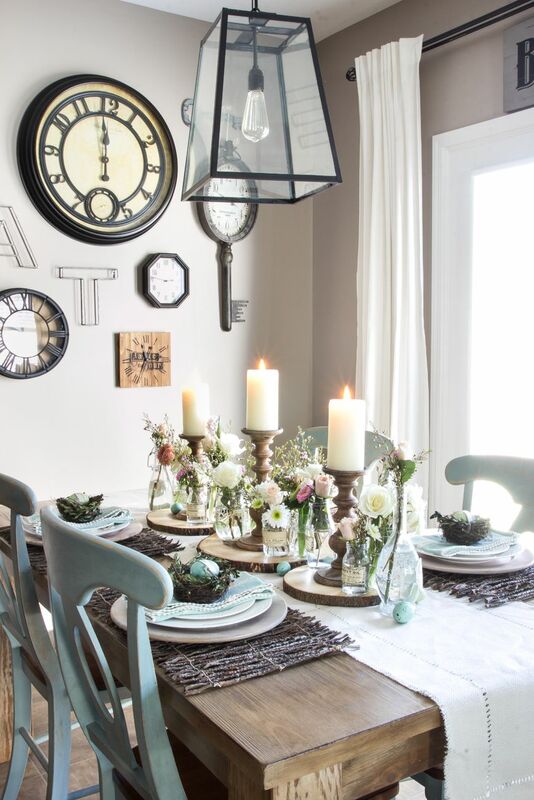 The tablescape is as charming as it is simple. Fun detail: each guest gets a personalized egg with their name on it. You may have seen this type of robin blue painted Easter eggs around and you may have thought they look lovely. Well, you could make some for your own table setting this year. If you like the distressed look, check out to find out how to apply it to your own eggs. You’ll need pastel blue paint, metallic brown paint for the speckles and a toothbrush. 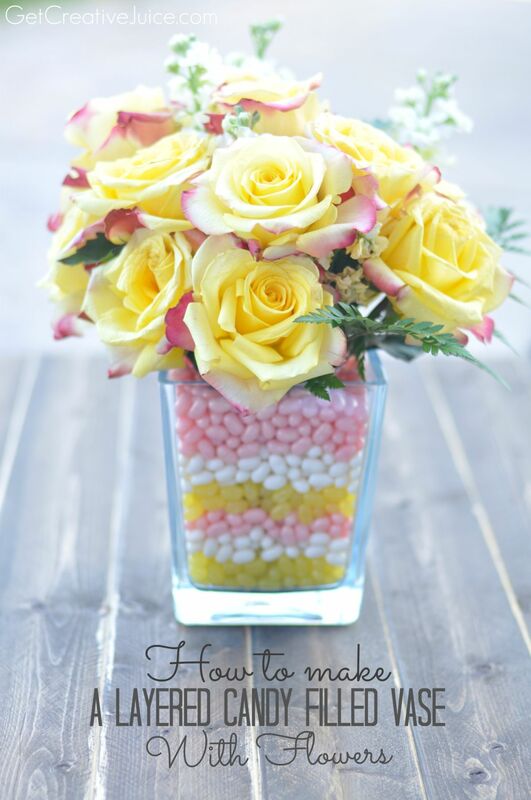 Add some sweetness to your Easter decor this year with a layered candy-filled vase which you can use as a table centerpiece. The candy and the flowers don’t ever touch each other since there’s a solid barrier between them. The trick is to put a smaller vase inside the bigger one and to fill the space between them with candy. The flowers go into the vase which means you can actually use fresh ones. This sweet idea comes from . 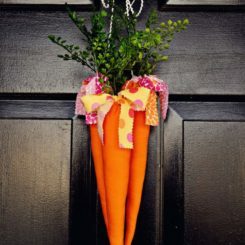 There’s really no point in spending too much money on Easter decorations since you can make some really lovely ones with a minimal budget. 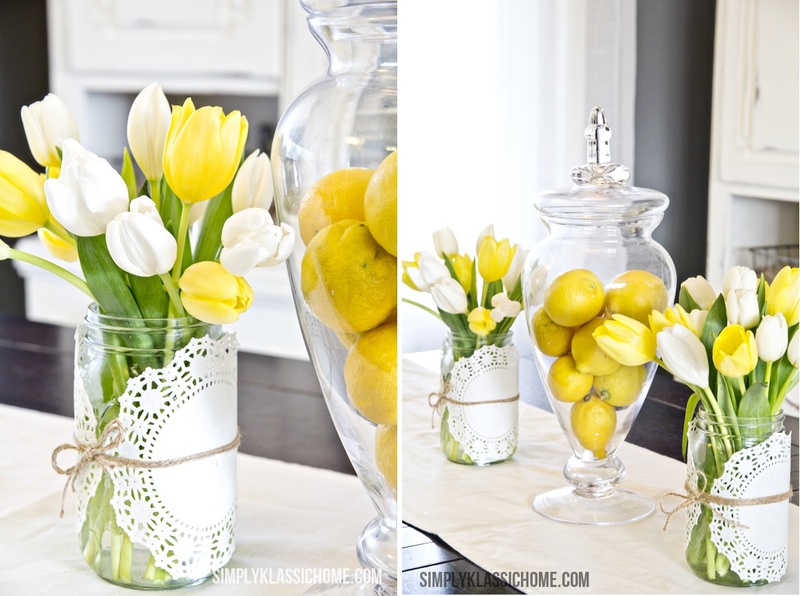 For instance, you can put a bunch of fresh lemons or oranges in a glass apothecary jar and some tulips matching the color of the fruits in jars decorate with paper doilies and twine. Curious where we got this idea from? cCheck out . 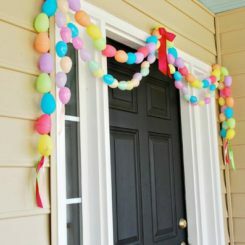 You can also find a bunch of cool and affordable Easter decorating ideas on . For example, here you can find out how to make tissue paper pom-pom decorations which you can hang from the ceiling, ribbon napkin rings or seasonal bouquets decorated in paper butterflies. We suggest looking at the big picture whenever you consider individual decorations and accessories. It’s important to ensure a nice balance between all these elements. For instance, if every single item is brightly-colored that wouldn’t really look good. Also, if the centerpieces are simple, you might want to add some quirky or colorful place cards or other details to avoid a monotonous look. On you may find some inspiration in this direction. When spring finally comes, we’ve all very excited but we’re also nervous because we don’t want all the beauty and the freshness to be taken from us by the harsh winter. By Easter the weather usually stabilizes itself. Even so, it’s natural to want to protect the newly discovered freshness of spring. 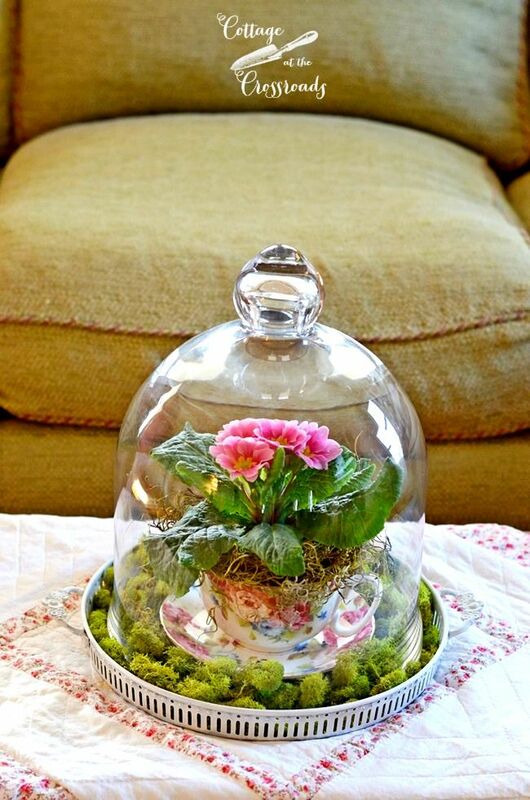 You can do that with a glass dome. 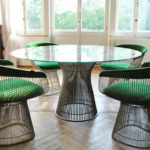 By that we’re actually suggesting you create a table centerpiece similar to the one on . We didn’t forget about the Easter eggs either and we have a really cool idea that you might like too: string Easter eggs. 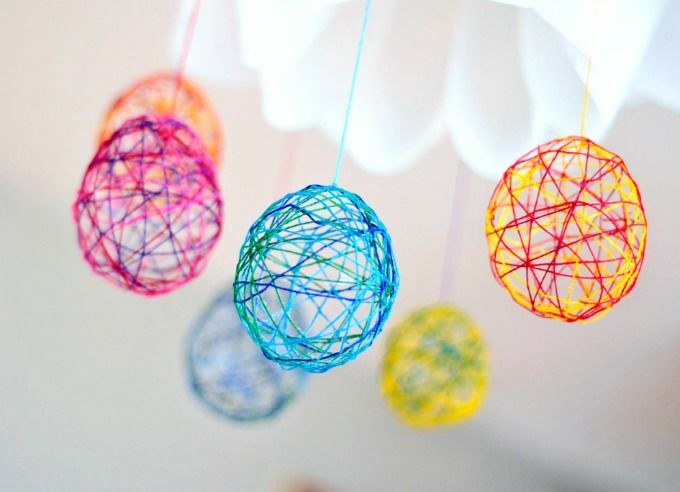 These delicate-looking decorations can be crafted using embroidery floss, water balloons and blue. The process is similar to that of crafting a string lampshade. You can find all the details along with instructions on . 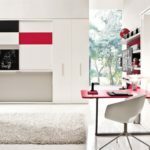 As you’ve seen, there are many different themes and design strategies to choose from and picking the one that suits you and your home best can be a challenge. To help you make that decision, we suggest checking out the options offered on . 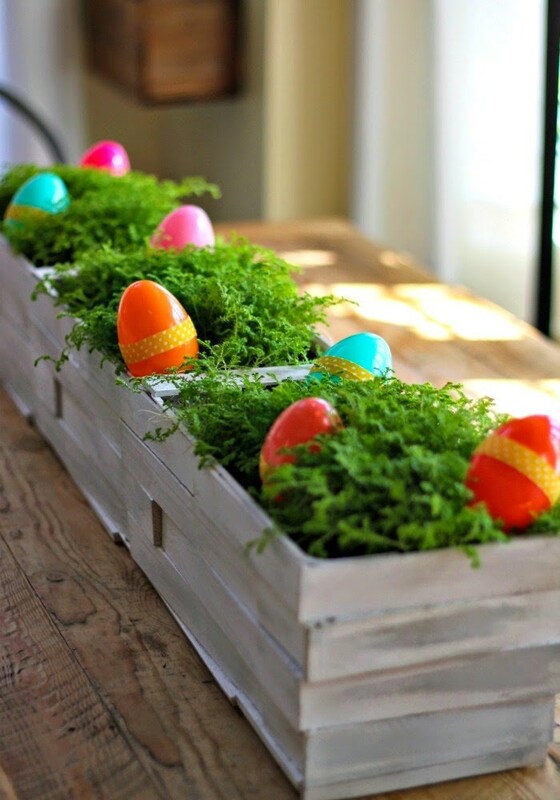 They can help you decide whether you want your Easter decor to be simple, bohemian, rustic, botanical, classic, etc. 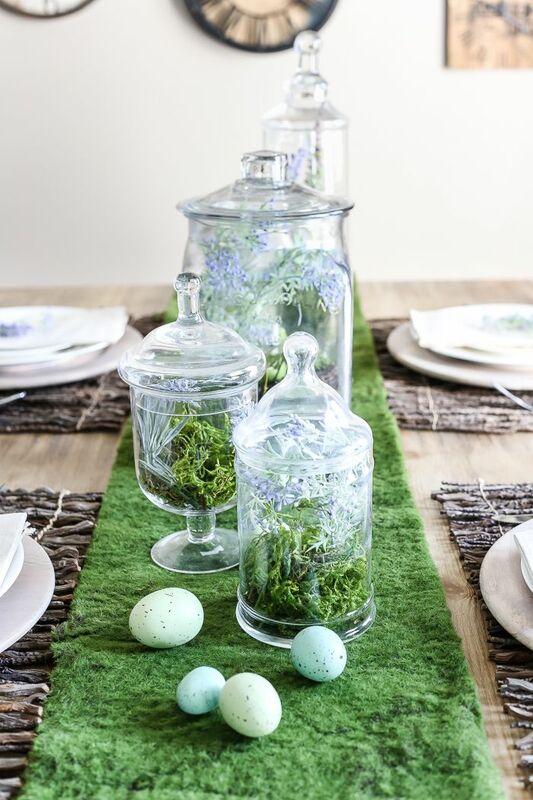 Since simple things are a lot of times the most charming ones, there’s no point in complicating your Easter decor more than you have to. 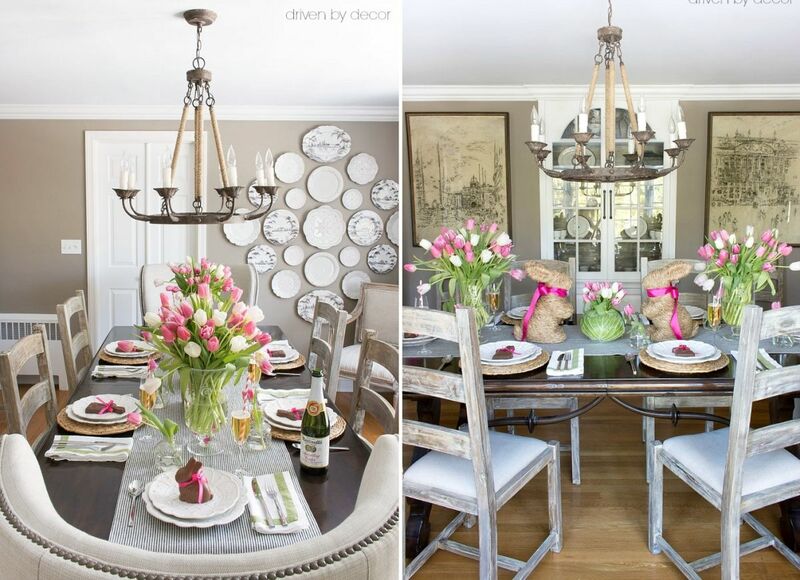 Check out this simple centerpiece ideas featured on . Isn’t it gorgeous? You could make your own version out of a wooden box filled with moss and a bunch of faux Easter eggs. Actually, you could display real eggs as well. 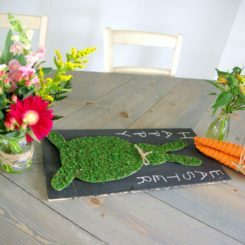 Another centerpiece idea suitable not just for Easter but for spring in general can be found on . It starts out with a tray. sDecorate the bottom with wrapping paper or a piece of fabric and put a vase at the center. This one is actually a painted Mason jar. Fill it with seasonal flowers and display a few ornaments around it, like balls of moss, eggs, cute bunnies and whatever else you see fit. 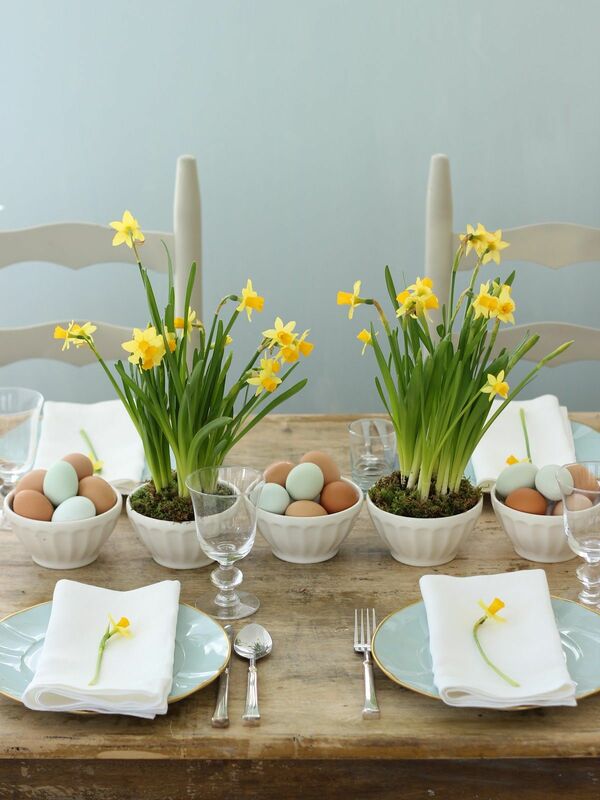 There are many different ways in which you can incorporate eggs into your Easter table decor. Some prefer to paint the eggs and to display them in baskets or in little nests and others choose a more unconventional approach. 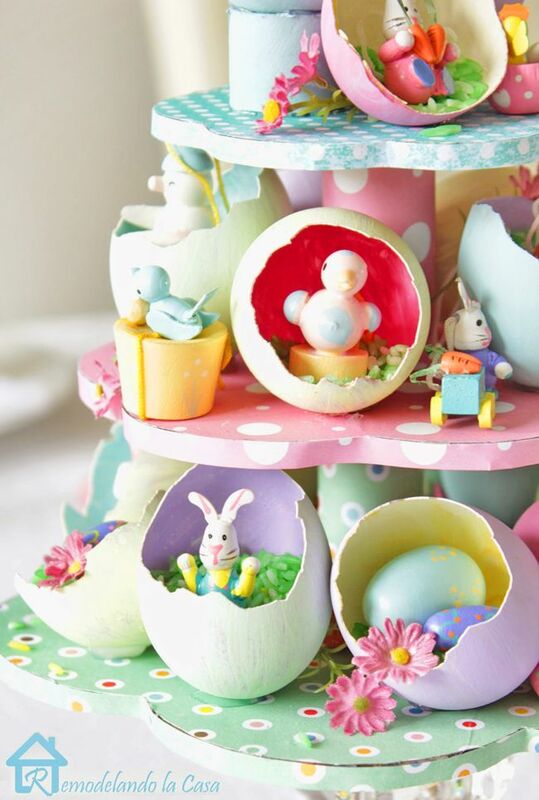 If you like to think outside the box and if you like cute designs, check out where you’ll find an awesome Easter egg tree centerpiece. It’s one the cutest things we’ve ever seen. 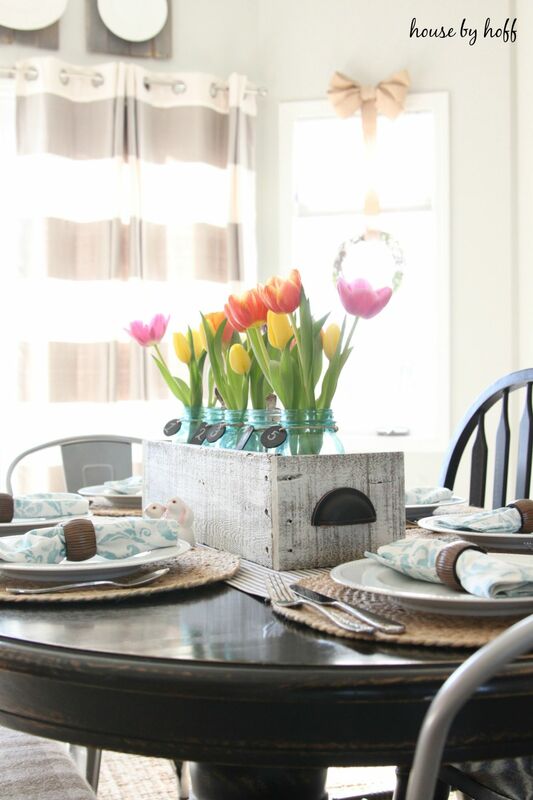 Finally, we end the list with a charming spring centerpiece idea from . You may not notice it at first but those beautiful flowers are placed not in a vase but in a moss basket. How cool is that? Apart from that, we also appreciate this centerpiece for its beautiful colors. The pastels contrast with the dark green in a really nice way.